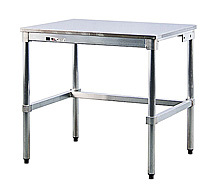 A removable stainless steel top rides on an aluminum table frame for all the strength of steel, the durability of stainless, and the cost savings of aluminum. All surfaces are wash down capable. Legs have adjustable feet for easy leveling. This table is NSF certified. Comes with a manufacturer's 5-year warranty on construction, and a lifetime warranty against rust and corrosion on materials. Ships knocked-down.